The Khangchendzonga Biosphere Reserve In Sikkim, Surrounding The World’s Third Highest Peak Mount Khangchendzonga, Has Been Added To UNESCO’s World Network Of Biosphere Reserves, Making It The 11th Biosphere In India To Be Included In The Network. Its Location – Bordering Nepal, Tibet (China) And In Close Proximity Of Bhutan – Offers Unique Opportunities For Joint Collaboration And Conservation Of Biodiversity With Neighbouring Countries. The Landscape Is A Testament To How Religion, Culture And Environment Protection Can Coexist Harmoniously. Increasing Unregulated Tourism, Lack Of Awareness About The Landscape And Shortage Of Staff Are Some Of The Key Challenges In Maintaining The Reserve’s Sanctity. 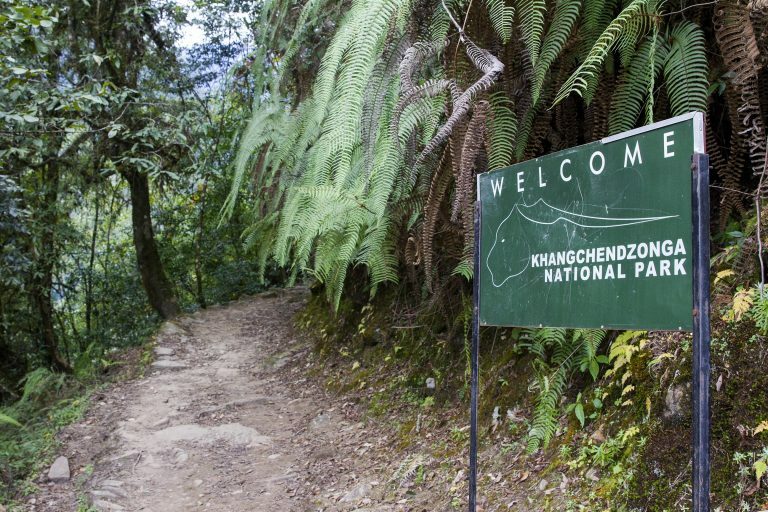 Popular among trekking and hiking enthusiasts, the Khangchendzonga National Park(KNP) in Sikkim is the starting point for several stunning trails, taking explorers up and through a dizzying variety of forests and terrains to sites offering breathtaking views of Mt. Khangchendzonga, the world’s third highest peak. But KNP, unlike other national parks, is rather special. The park represents a protected core area ensconced within the massive Khangchendzonga Biosphere Reserve (KBR), in the eastern Himalayas. The park not only offers a glimpse of the astounding biodiversity, from rare orchids to the endangered red panda, it also showcases how nature and human beings thrive side by side in harmony. This syncretism of religion, culture and environment protection, is a testament to the reverence of the indigenous communities, for their “guardian deity” Mt. Khangchendzonga. Entrance to the Khangchendzonga National Park, Sikkim. Photo by Kartik Chandramouli/Mongabay. While the landscape has engendered the communities’ cultural identity (rocks, peak or lakes are invoked in rituals), their traditional knowledge has shaped and influenced conservation so much so that in one instance, the people’s opposition to two hydropower projects on the “holy river” Rathong Chu, on religious and environmental grounds, led to the scrapping of the projects. This 1784 square km high-altitude park is, in fact, so important, both ecologically and culturally, that in 2016 it was recognised for its tangible as well as intangible heritage as a UNESCO Mixed Heritage Site, the first such site in India designated both for cultural and natural significance. Now, two years on, the biosphere reserve, bordering Nepal to the west and Tibet (China) on the north, has been brought under UNESCO’s World Network of Biosphere Reserves (WNBR), of the Man and the Biosphere Programme (MAB), bringing cheers to the state of Sikkim, already feted for its conservation, ecotourism and organic farming policies. Welcoming the development, conservationists, scientists and locals believe the renewed attention will help put in place measures to address gaps in conservation, development and livelihood challenges including setting upper limits for tourists to the core area and reducing pressure on natural resources in transition zones. Tashi Wangdi, director and member secretary, Indian National MAB Committee of the Ministry of Environment, Forest and Climate Change, said the new designation broadens the possibility of engaging and co-operating with biosphere reserves in the MAB network internationally in order to look at conservation and development in a holistic manner. “In the biosphere reserve, we have core, buffer and transition zones. The KNP is the core area in the KBR. It is a legal identity and under the Wildlife Protection Act. But the buffer and transition zones go hundreds of kilometres beyond the core area and that is where the challenge lies,” Wangdi told Mongabay-India. As per UNESCO, the buffer zone adjoins the core area and is used for activities compatible with sound ecological practices that can reinforce scientific research, monitoring, training and education. The transition area is the part of the reserve where the greatest activity is allowed, fostering economic and human development that is socio-culturally and ecologically sustainable. About 35,000 people, mainly from the Lepcha, Bhutia, Nepalese and Limboo communities inhabit 44 villages in the areas surrounding the park. “We have to work on how we can ease the pressure on the forest and natural resources and how we can improve the socio-economic status of the people in the area. They rely on the forest and natural resources for their livelihood so one area of work is extending alternative livelihood options so that pressure on natural resources can be minimised,” Wangdi said. 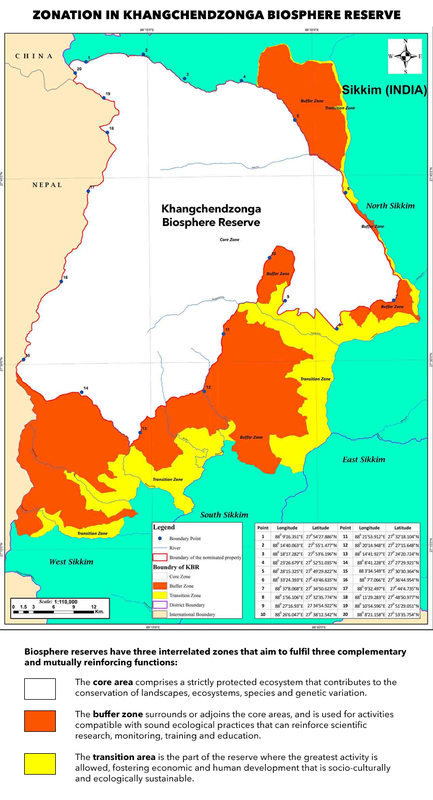 Zones in the Khangchendzonga Biosphere Reserve. Photo from Khangchendzonga National Park nomination dossier. This apart, the WNBR widens the scope for better engagement of concerned ministry departments for troubleshooting as well for facilitating funds and resources for conservation work. “In addition to that, we give importance to research and development activities so that we can find out gap areas in conservation, in development and in livelihood so they can be addressed,” Wangdi said. Hemant K. Badola, advisor (biodiversity) in the office of Sikkim’s Chief Minister Pawan Chamling said the state is giving high priority to the conservation of landscape and importance to culture dissemination among masses. “To regulate and monitor growing tourism over ecologically sensitive Himalayan zones and fragile terrains is a tough task. The organic landscape of Sikkim fascinates tourists. The Sikkim policies on tourism and ecotourism are clear manifestations on necessary measures, taking strong community participation,” Badola, told Mongabay-India. “Worldwide, various scientific studies suggest the organic management in cropping help augmenting species richness and improved biodiversity. Over the years, pieces of evidence emerged that the organic farming in the transition zone of KBR has resulted in increasing soil fertility, better water absorption and abundance of pollinators, that helped vivid enhancement of biodiversity elements, both floral and faunal,” Badola added. 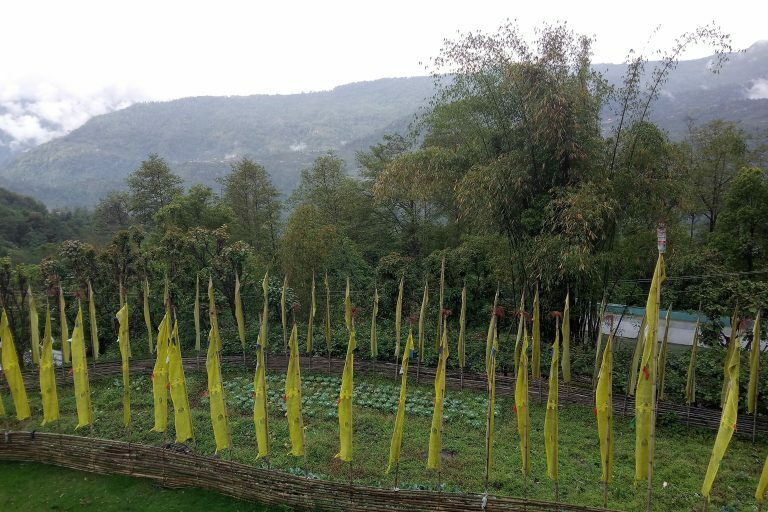 Organic farming in the transition zone of Khangchendzonga Biosphere Reserve has influenced biodiversity conservation in the area. Photo by Sahana Ghosh/Mongabay. Occupying nearly 40 per cent of the state, this biosphere reserve is one of the highest ecosystems in the world. Within an area of 2931 square km, the landscape slopes up from 1,220 to 8,586 metres. Located in the Himalaya global biodiversity hotspot, KNP/KBR complex’s rugged and ancient terrain carpeted by old-growth forests draws birding and wildlife enthusiasts, pilgrims, rock climbers and star-gazers among others. At Yuksom, a tranquil hamlet close to the entry of the KNP, friendly hosts, unhurried lifestyle and warm, inviting homestays that complete the rustic experience with traditional food are not only ensuring a sustainable livelihood for the locals but also enabling them to protect and manage forests in accordance to the state’s ecotourism policy. Yuksom is the first capital of Sikkim. 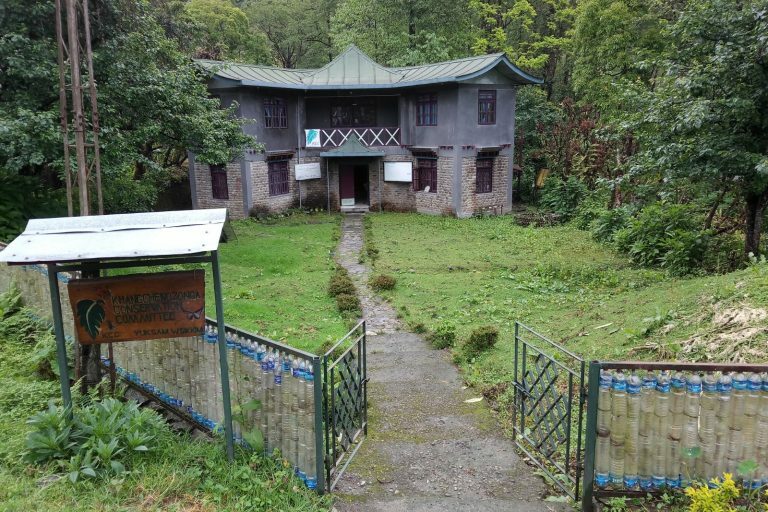 Considered a pioneer in ecotourism in India, Yuksom-based NGO Khangchendzonga Conservation Committee (KCC), registered with the Sikkim government, helps locals run and manage homestays and also monitor impacts. KCC has been assiduously monitoring the influx of trekkers and the items and waste they bring into the national park. On their exit from the park, each item brought back is checked against those listed upon entry. If the items brought back are fewer than the ones taken in (implying littering inside the protected area) they are fined. Similarly, unauthorised extraction of medicinal plants and specimens including butterflies and moths is a strict no-no. Of late, the organisation’s Pema G. Bhutia revealed, travel companies bringing in a large number of tourists at one go has become a cause for concern. He emphasised the importance of estimating the park’s carrying capacity: the number of people inside the park at one time. The Khangchendzonga Conservation Committee office in Yuksom, Sikkim. Photo by Sahana Ghosh/Mongabay. “One aspect we are looking at is exploitation of the national park by some travel companies. We have certain travel companies who are promoting mass tourism bringing 40 to 50 people in one go. Following the UNESCO tag for the KNP we had hoped there would be studies and regulations in place regarding carrying capacity of the area. We hope that with the renewed focus, some steps can be taken,” Bhutia told Mongabay-India. Siktel pointed to the park’s management plan (2008-2018) that mentions the perils of unregulated tourism including damages to vegetation and change in the behavioural pattern of wild animals in general. Data provided by KCC shows the KNP received 457 tour groups and 289 international groups in 2012 while the numbers dropped to 150 (India) and 181 (international) in 2015 following the Nepal earthquake. The year 2016 witnessed an uptick to 261 (India) and 186 (international). But numbers are just one side of the coin. One of the key tenets of ecotourism practised at Yuksom is the interaction between hosts and guests. According to Uden from KCC, this interaction (a casual chat over a bonfire, or on a jungle trek) is aimed to apprise visitors of the importance of the landscape and culture. The more they learn, the fewer chances there are for any inadvertent harm to the place. But many private hoteliers and fly-by-night operators disregard the education part of the deal. 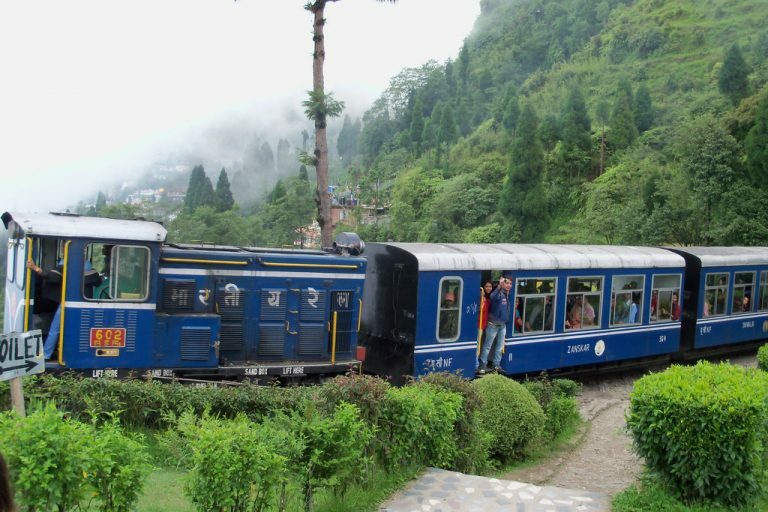 To drive home the point on awareness, KCC’s Bhutia cites the example of the Darjeeling Himalayan Railway, popularly called the “toy train”, which is also a UNESCO World Heritage Site. The Darjeeling Himalayan Railway or toy train is a World Heritage Site. Photo by SupernovaExplosion/Wikimedia Commons. “The kind of joy and pride that one experiences while riding the Darjeeling toy train, similar pride and joy should be felt by visitors to KNP/KBR landscape. Instead of thinking that one is travelling to one of those national parks, they should feel the difference in understanding that KNP is special. We need to work hard and create awareness in this regard,” Bhutia stressed. Diminishing use of Lepcha, Bhutia and Nepali languages, the changing character of traditional villages and questions about the cultural appropriateness of tourist-town “nightlife” are listed in the management plan as some of the apprehensions regarding impacts of tourism. This story was first published on Mongabay. Read the original story here.